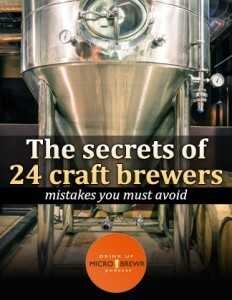 MicroBrewer’s new 52-page ebook will help your brewery succeed. Learn from experts in craft beer. Do you want to start a brewery, but don’t know the first step? Do you have a passion for craft beer, but don’t know how to translate that to a business? Are you excited about the possibilities of the craft beer industry, but feel helpless about owning your own business? I want to start a brewery, but I was left realizing that I’m not really qualified. So I took a step back and made a few calls to try and figure it out. MicroBrewr Podcast has given me access to so many successful brewers, brewery owners, and others in the craft beer industry. I am honored that they share their experiences with us. Don’t struggle on your own, learn from the experience of others. The U.S. now has more than 5,000 breweries. There’s no sense in making all the same mistakes everyone else has already made. Why not learn from people who have already done it. 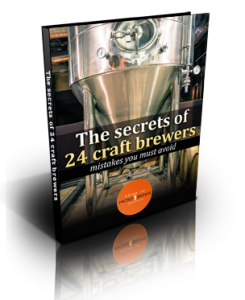 This ebook is the perfect opportunity to learn from people who started their brewery and are following their dream. What’s the biggest mistake you ever made for your brewery? Take advantage of the expert advice from experienced brewers and brewery owners. Don’t make the same mistakes they did. MicroBrewr Podcast lets us learn from others. Now this book takes the most important part–their biggest mistakes–and puts them all into one place to review and to keep as an easy reference. When you buy this book, you also get bonus materials. What’s the best idea you ever had for your brewery? Take advantage of the knowledge from people who have succeeded at their dream. Don’t wait any longer to open the brewery you dream of. Keep preparing, while you start to take action. Don’t put off your dreams for another year. What’s holding you back from opening your own brewery? Download this book and start learning from others now.